Workneh Gebeyehu became the Minister for Foreign Affairs when he took office on November 2016. Dr. Workneh Gebeyehu was the Minister of Transport of Ethiopia since September 2012. He has also been serving as an elected member of Addis Ababa city Council. In his political career, he had been a member of Oromo People`s Democratic Organization and EPRDF since 1991 and an executive member of both parties since 2012. 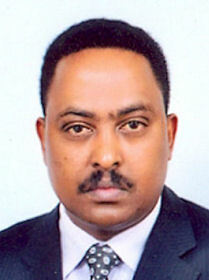 He was also a commissioner General of the Ethiopian Federal Police Commission from 2001 to 2012. Prior to his position as Federal Commissioner (1991 to 2000), he had been serving in different positions in regional and federal levels. Workneh Gebeyehu Negewo was born July 16, 1968 in Shashemene, Oromia [not to be confused with Workneh Gebeyehu (1925-1960), the director of security in the Ministry of Interior]. Educational background includes a BA in Political Science and International Relations, Addis Ababa University, 1991; MA in International Relations, Addis Ababa University, 2006; and PHD in Criminal Justice and Police Science, University of South Africa (UNISA), April 2016. His March 2016 doctoral dissertaion "An Analysis Of The Influence Of Politics On Policing In Ethiopia" evaluated the influence of politics in policing in Ethiopia generally pre-1991 and post-1991 as this is the period that characterise the Ethiopian political system, which underwent tremendous changes taking along various initiatives in its move towards democratisation. He noted that "policing is embedded into politics which by itself is a challenge because the police are expected to be professionally independent in order touphold the rule of law while at the same time guaranteeing the safety and security of all the inhabitants of the country. ... some police officers do not have a clear understanding of the police function and to who they should be accountable to. Both quantitative and qualitative findings indicate that the police are regarded as accountable to the public, but there are also indicators that police are accountable for the ruling party and its allies." Ethiopia’s Prime Minister Hailemariam Desalegn announced a Cabinet reshuffle November 01, 2016, following months of often-violent protests which led the government to declare a state of emergency. Ethiopia’s parliament unanimously approved 21 new appointees, the prime minister said Tuesday. He said the new ministers were picked for competence and commitment rather than “party loyalty." The appointees include a new minister of foreign affairs, Workneh Gebeyehu, who replaces Tedros Adhanom, a former health minister who has been one of Ethiopia’s most recognizable public figures in recent years. On 22 June 2017 Chinese Foreign Minister Wang Yi held talks with his Ethiopian counterpart, Workneh Gebeyehu, on bilateral relations. The Ethiopian foreign minister said Ethiopia-China relations are very important and of strategic significance. The Belt and Road Initiative Forum for International Cooperation has provided an important opportunity for the expansion of cooperation in all fields between Ethiopia and China, and Africa and China, said Workneh. Workneh said his country thanks China for its strong support and assistance to Ethiopia's efforts to realizing economic transformation. Ethiopia is willing to join efforts with China to expand mutually beneficial cooperation in such areas as economy, security, infrastructure, human resources and aviation, he said. Workneh Gebeyehu, Foreign Minister of the Federal Democratic Republic of Ethiopia briefed, on 12 July, 2017, members of US Congress as well as their Foreign policy advisers, legal assistants and staffers at the United States Congress. The Minister elaborated that his government’s Foreign Policy, which is all about fighting poverty and bringing about inclusive and sustainable development, is the mirror reflection of the domestic policies of the country. According to Dr. Workeneh, the establishment of industrial parks, mega hydro–power projects, linkage ininfrastructure with neighboring countries and hosting major international and regional summits could also be attributed to the sound foreign policy and strategy charted out by his government. In the Minister’s account,for the last two decades, the foreign policy of Ethiopia has given utmost priorities to sustained economic development, building a democratic system and ensuring peace and stability to the benefit of the Ethiopian peoples. By late 2017 Ethiopia had seen a resurgence of widespread protest across many towns in the Oromo region and a large scale ethnic-based conflict in the Somali-Oromo region and ethnic cleansing like moves in some regions in Oromia and Benshangul Gumuz region. By early 2018 Ethiopia had been rocked by months of protests demanding wider freedoms that have left hundreds dead and tens of thousands detained. The government released more than 6,500 detained opposition figures, journalists and others after the prime minister in a surprise announcement in January 2018 said he wanted to “widen the democratic space for all.” The protests have disrupted life and business in one of Africa’s fastest-growing economies.